Basil, the Most Nutrient Rich Herb | Audio and video stories from Southwest Washington. Many herbs contain more disease preventing phytochemicals than even vegetables. Of all the herbs in the plant kingdom, basil has the highest score of protective and healing properties than any other herb. Basil scores a 475 out of 1000 in terms of nutrient richness and is loaded with phytochemicals to the max. 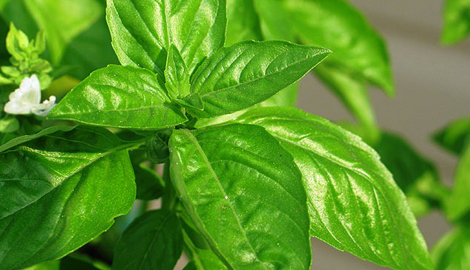 Basil is especially good for digestion, so those with stomach problems may find it to be an especially effective aid. 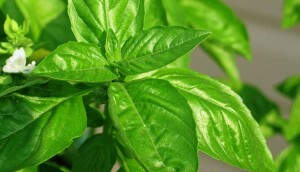 Two of its most unique compounds for disease prevention are basil’s flavonoids and volatile oils. Studies of white blood cells show that basil’s flavonoids provide DNA protection from radiation and oxygen-based damage for our cell structures and chromosomes. Seven different anti-bacterial properties from basil’s volatile oils are shown to restrict the growth of unwanted bacteria which otherwise pose serious treatment difficulties because of their highly developed ability to resist antibiotic treatments. Additional health benefits of basil include its anti-inflammatory effects and its potent source of beta-carotene (vitamin A) which serves to protect the lining of many body structures such as blood vessels from free-radical damage. Diseases such as rheumatoid arthritis, asthma, and osteoarthritis are shown to particularly benefit from these two nutritional advantages. Basil’s high magnesium levels further promote vascular health by improving blood flow and encouraging blood vessels to relax. While the leaves of basil look a lot like peppermint, to which it is related, basil has both a slightly sweet and delicate peppery flavor. 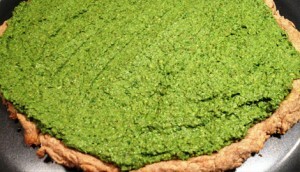 Basil is most recognized as the main ingredient in pesto, a savory spread typically made from cheese, pine nuts, oil, and basil. For the adventurous at heart, there are over 60 varieties of basil available, each with its own unique tastes such as lemon basil, anise basil, and cinnamon basil. Whether in smoothies, salads, soups, or any other dish, enjoy the delicious flavor of basil as part of your regular diet and reap its many versatile health benefits as you do. Just be sure to include the stems however it is eaten, as there are even more phytochemicals in the stems of basil than in the leaves themselves! Stay tuned for an exciting treat next week as I will be sharing my newly developed favorite pesto recipe (dairy, gluten, & guilt free), as well as a surprisingly delicious and unique way to use it on one of America’s most favorite foods.